Since 1976, we have sold and manufactured bars for home and commercial use. Selling to customers all over the world. Bars can be custom made to your specific requirements and we also usually carry over 25 in stock. Whether you are looking for a large 20 foot bar for a restaurant or an 8 foot bar for your game room at home we have many in stock for you to choose from. 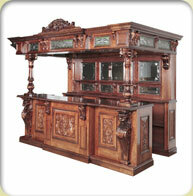 We can design and build your custom bar in a broad range of styles from traditional right through to contemporary. We offer a full installation and insured delivery service to anywhere in the world. If Jere's Antiques can be of assistance please do not hesitate to call.